A huge green sea turtle weighing more than 200 kilograms and is believed to be more than 100 years old, was literally assisted and helped back to its natural habitat, at Bantay Dagat Area in Tanauan, Leyte. Going back to its natural abode was a difficult task for the green sea turtle tagged as PH1000B, because it was too big and too heavy, its front limbs could hardly support the bulk of its weight in the sand. Mayor Roque Tiu said that the shores of Tanauan Leyte have indeed become a sanctuary of local turtles. Every now and then, one or two gets entangled in the fishing nets of local fishermen, he said. However, the huge sea turtle came as a surprise to everyone, Mayor Tiu said. The green sea turtle got entangled in the fishing net of Marcial Gabradilla, a 59 year old fisherman from Barangay Bislig of Tanauan, in the early morning. The Bantay Dagat team had to ask for additional assistance because the turtle or pawikan in the local dialect was too heavy and could not be transferred to the patrol boat of the Bantay Dagat. Mr. Tito Simbulan, the chief of the Protected Areas and Wildlife Coastal Zone Management Service of the Department of Environment and Natural Resources, said that the sea turtle which he described to be a green sea turtle, is the biggest he has ever seen. Mr. Simbulan said that the green turtle was the quintessential Green (Chelonia mydas) turtle, possessing a dorsoventrally-flattened body covered by a large, teardrop-shaped carapace and a pair of large, paddle-like flippers. When measured, the Tanauan green sea turtle's carapace was 105 centimeters long and 94 centimeters wide. Despite the turtle's common name, it is lightly-colored all around while its carapace's hues range from olive-brown to black, just like any other Eastern Pacific green sea turtles. The turtle is actually named for the greenish coloration of its fat and flesh. The green sea turtle is the latest addition to the already long list of turtles found and returned to their natural habitat by Tanauan fishermen who are already aware that pawikan belong to the endangered species and must be returned to the sea after being tagged by the DENR, Mayor Tiu said. Aware of the local government's policy on the conservation of natural resources, the fisherman turned over the green turtle to the town's Bantay Dagat members, who informed Mayor Tiu and the Department of Environment and Natural Resources about it. Mayor Tiu lauded the fishermen in Tanauan for their awareness in protecting the endangered species. He said that the turtles are referred to as the only living remnants of the dinosaur age, but maybe not for long. Unless sincere efforts are undertaken, they might follow the dinosaur to extinction. Sea turtles, popularly known in the Philippines as pawikan, belong to the sub-order Cryptodira, and to the families Dermochelyidae and Cheloniidae. 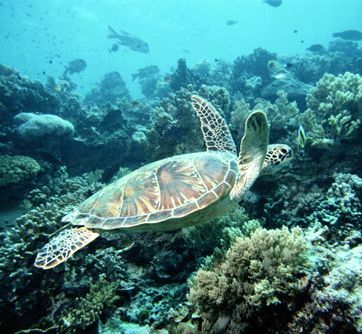 There are more than 220 species of turtles in the world, but only seven are considered marine (saltwater). Five of these species are present in the Philippines. These are the Green (Chelonia mydas), Hawksbill (Eretmochelys imbricata), Loggerhead (Caretta caretta), Olive Ridley (Lepidochelys olivacea) and the Leatherback turtle Dermochelys coriacea). So far, two of the five species have been found in Tanauan, the green sea turtle which is the most common species in the Philippines and is found in all tropical and sub tropical seas; and the olive ridley which of the five species is considered carnivorous. Sadly, despite the government's Pawikan Conservation Project, pawikan hunting will remain unabated elsewhere unless people in the area cooperate.